The Frederick Law Olmsted Society 2008 Architectural Restoration Award was presented to Vince and Dawn Hartnett for exterior restoration work completed at 253 Olmsted Road originally built in 1915. The owners restored the Front Porch and the partial façade of this Colonial Revival Shingle style landmark home. 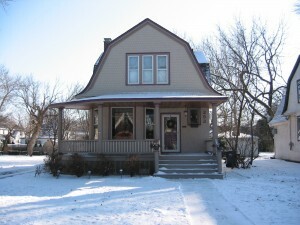 This home was a Montgomery Ward Catalog home numbered 121 and was designed by William Radford, an architect who was a previous resident of Riverside. 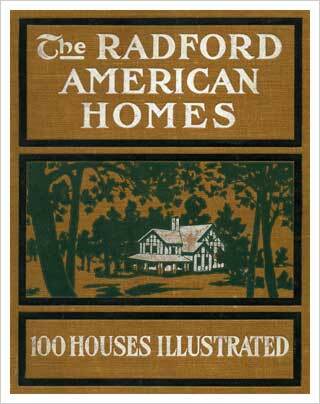 Radford created his first catalog of homes in 1903 and proceeded to publish 2 more housing catalogs. Over 100,000 catalog homes were built in the United States between 1903 and 1940. Plans were supplied for the cost of 1 to 5 dollars. For approximately 1000 to 2700 dollars the building supplies were shipped by rail which included two boxcars that were assembled by the homeowner or contractor. The foundations were typically paid for and provided by the homeowner. The stock market crash of 1929 began the catalog homes gradual decline and by 1940, the last printed catalog of homes was published. Catalog Homes were the predecessor to prefabricated houses, and the most popular of the pre-conceived homes. These well designed and well proportioned homes have their place in history as evidenced by the Riverside landmark designation.